Wembley Stadium and the Emirates Stadium. The wife and I visited both, last month, within a 72 hour period. Firstly, on Sunday 23rd, we attended the fifth instalment of the NFL International Series as the Tampa Bay Buccaneers 'hosted' the Chicago Bears. Then, the following Tuesday, we made our long-awaited first visit to Arsenal's Highbury-replacement as the Gunners entertained Bolton Wanderers in the Carling Cup. The rather expensive NFL tickets were a 30th birthday present from my parents. I first got into the NFL in the early 1990s; a childhood friend of my Dad's lived in Plano, nr Dallas, and when he visited the UK he would always bring with him some Dallas Cowboys merchandise (caps, mugs, car stickers etc.). An NFL highlights show, presented by the excellent Gary Imlach, was shown by Channel 4 on Saturday mornings around this time and the Cowboys - led by the Hall of Fame 'Triplets' Troy Aikman, Michael Irvin and Emmit Smith - were creating a dynasty of three Superbowl wins in four years. 'Proper' football never lost its stranglehold on me, however, and the NFL fell completely by the wayside as the game in this country moved from terrestrial TV to Sky. Perhaps I had exhausted football, to an extent. Certainly English football. Part of what attracts me to the NFL is - I think - the degree of exoticism, of other-worldliness, that it provides; new tactics, new personalities, new traditions, new teams. Histories and legends to be researched. I think some of these same things are what attract me to German football as well ... plus the beer and the sausages, of course! Regardless, it would be safe to say that I couldn't wait for my first ever experience of the NFL action in the flesh. The game was rather sloppy, but it was a tight affair that went down to the final minute (as, in my experience, is increasingly common in the NFL). The atmosphere was good, with a variety of NFL team colours on display. A variety of nationalities were also present; I heard French, German and Spanish voices, while plenty had obviously travelled from Chicago, and the bloke sitting directly behind us was a die-hard Bucs fan from Florida who was living in Germany (and distraught by their performance and defeat). It had been a bad day for the Glazers (both their NFL and EPL teams had lost, with Man Utd getting spanked by Mansour City ... by a barely believable but absolutely hilarious 6-1 scoreline), but a good day for us. A good day that would be rounded off by a few pints in the Green Man pub - where I had last drank with the Macleods and Northwood Mark, both before and after Whitley Bay's Vase triumph over Wroxham at Wembley in May 2010 - which was packed full of NFL fans watching the late games on Sky. My parents, en route from watching Chelsea lose at QPR with my sister, picked us up and gave us a lift home. When connection allowed, I kept checking the Cowboys score via the internet on my phone. They beat Stan Kroenke's St Louis Rams 34-7, with rookie DeMarco Murray breaking Emmit Smith's single-game running record. Great stuff. Back to my first love on the Tuesday. First love in two senses; football (generally) and Arsenal (specifically). We'd been planning on attending a game at the Emirates (any game, not necessarily AFC) ever since the stadium had opened, but things had always gotten in the way (gotten in the way of the cheap games I mean; little chance of me spending £40+ to watch a game of football). The KSG's trip to Berwick Rangers vs East Stirlingshire had clashed with Scotland vs Brazil at the Emirates, for example, whilst the wife and I hadn't arrived back from Santorini in time to catch Arsenal's win over Shrewsbury Town in the previous round of the Carling Cup. As such, when I was reminded of this particular fixture, I snapped up a couple of £20 tickets pronto (£10 tickets were also available). Cheap tickets for Carling Cup games (and bigger FA Youth Cup matches) is a great initiative by AFC, one which resulted in a 56,628 crowd for this particular game. After catching a train from Windsor to Waterloo, straight from work, I met with the wife at Piccadilly Circus. The tubes to Arsenal were absolutely heaving, but at least you exited more or less straight into the ground. After a seemingly endless, fluorescent-jacketed steward-supervised ride in a lift up (and down) the various levels of the East Stand, we took our seats (very comfy, with plenty of leg-room) just as the game kicked off. The view was great - it was like watching a computer game - while the ground seemed more enclosed than it does on TV. The atmosphere was also decent, no doubt helped by a different kind of fan coming to the game, owing to the reduced prices. It was an entertaining and open game, with a near full strength Bolton side clearly desperate to end a disastrous run of form. Gary Cahill was imperious at the back (and he also looked a real threat going forward), while Ricardo Gardner caught the eye (completely snuffing out the lightweight Alex Oxlade-Chamberlain). Arsenal's youthful full-backs were decent going forward, with Ignasi Miguel (who had starred against MUFC Ltd at York Road in a pre-season friendly a few summers ago, and was playing out-of-position - at left-back - here) controlling one goal-kick out of the sky like Dennis Bergkamp in this pomp! Thomas Vermaelen made several timely blocks before being substituted with a minor calf injury towards the end. Yossi Benayoun was full of running and willing endeavour. Emmanuel Frimpong and Francis Coquelin gave the ball away - and won it back - with equal regularity. The two Arsenal goal scorers stole the show, however. Bolton had taken the lead after half-time, when Frimpong was unable to control Coquelin's ill-judged pass, and the ball wound up inside the six-yard box at the feet of former Arsenal youngster Fabrice Muamba. 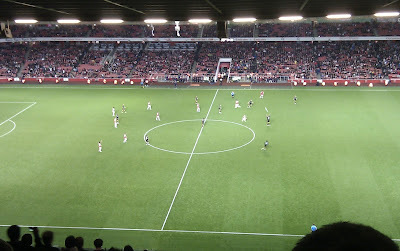 Arsenal drew level almost immediately, though, and were ahead not long after. Andrey Arshavin had a hand in both goals; firstly driving a right-footed shot in off-the-post and then superbly delaying a pass to play in Korean striker Park Chu-Young, who curled home his first Arsenal goal, a la Thierry Henry. "Who are ya? Who are ya?" bellowed the Emirates crowd, almost as one, while pointing at the tiny away following hidden away in a corner to our left. Arshavin, playing in a central role, went from the sublime to the ridiculous, within the blink of an eye, throughout the night. A frustrating player, certainly, but one who is capable of making something out of nothing. Park was, IMO, Arsenal's outstanding performer. Somewhat off the pace - and off-side enough times to make both Chuk Agudosi and Emmanuel Adebayor blush - but exhibiting great touch, and more-than-capable of holding the ball up when needed. As aforementioned, a great finish from him as well. After a few nervy moments at the end, including a Lukasz Fabianski flap and a missed chance from Ivan Klasnic, the final whistle sounded. Many had left before time, of course, including the American tourists sat behind us (I heard French, Italians and Japanese as well, and reckon there were more foreigners at the Arsenal game than were at the NFL). While I would never leave a game early (my Dad tells a story about how he left Chelsea game with minutes to go when they were 2-0 down, only for him to miss three injury time goals as they came back to win the match! 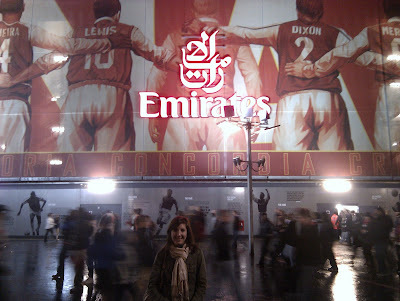 ), I can understand why people do so at the Emirates. Even with the vastly reduced crowd, it still took us an age to exit the East Stand after the game had ended. We thought we'd give Arsenal tube station a miss, and instead posed for photos outside the ground entrance before walking unhurriedly to Highbury & Islington. Despite the game having been finished for about 25-30 minutes at this point, there were still huge queues just to get to the station entrance. As such, we decided on a quick drink (my first taste of raspberry flavoured Kopparberg) in a nearby pub before setting off - on foot - down the A1 towards Angel, passing countless independent restaurants and bars (many jam-packed; recession, what recession?? ); I can now understand why Islington is such a popular place to live. I then overheard a couple of Arsenal fans, on the tube back to Paddington, talking about the upcoming away game at Norwich City. One, a season-ticket holder, had missed out on a ticket for the game (AFC were apparently allocated 2K). He mentioned that you had to have been to 46 AFC games in the last two seasons to even get the chance to apply! 46 games in two seasons?? I'd just been to my first since, it transpires, Tuesday 24th January 2006 (an after-extra-time defeat to Wigan Athletic at Highbury in the Semi-Final 2nd leg of the Carling Cup); two games in five seasons! I was to contemplate this over dinner (Burger King! ), before we caught our intended train back to Maidenhead with time to spare. In conclusion, two thoroughly enjoyable spectacles. I'm really pleased to have finally ticked off an NFL game, and a match at the Emirates. It all felt a little strange, though. These had both been one-offs, courtesy of an expensive birthday treat and a discounted entry offer respectively, and it was clear that we weren't the only ones for whom these games had been new and rarefied experiences. Now, obviously the NFL is usually played in another country, but I'd certainly like to go to Arsenal on a more regular basis. As aforementioned, I'm loathed to pay the extortionate prices that it would take to do so, however. It was almost as if these two events had been - for us and many others - more like going to the opera, the ballet, or a fancy meal, rather than a sporting occasion. To me, at least, this seemed like first-hand evidence that top-level sport is becoming more elitist and inaccessible, increasingly moving toward light entertainment for big-spending corporate types and away from it's traditional core support. To all those youngsters attending an Arsenal match for the first time (or virtually the first time) - and thoroughly enjoying a sing-song and the atmosphere in general - I felt like saying "get yourself down to your local lower/ non league club, it's like this all the time" ... and then I remembered that it's not just top-level sport that is seemingly in the process of selling it's soul.